I have an interesting Italian overload unit that a customer is using....no brand name. It has a little chart on the front that has the words FLC (which I assume is full load current) and Y/Delta. The vertical scale shows the current relationship to voltage on either side. I.E. Y or 460 on one side and Delta or 230 on the other side. 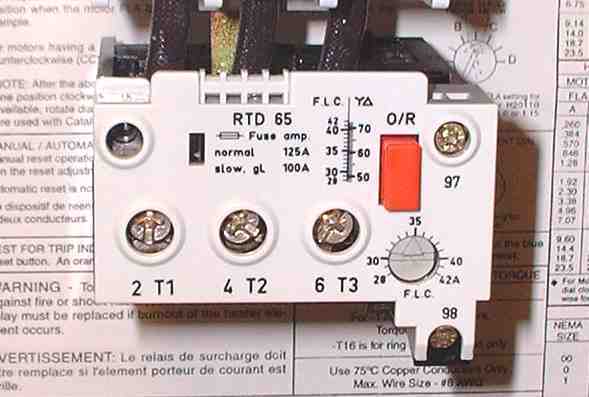 The issue is the dial for the overload gap is the identical scale as the Y or 460 volt FLC side. Does the vertical scale represent the overall KVA rating of the overload? I understood (and maybe I'm wrong) that thermal overloads were a function of material and resistivity and does not disiminate voltage sources. I.E. The unit trips at 65 amps regardless if it is 230 vac or 460 vac. Is anyone familiar with this type of overload? Bi-mettalic overloads trip based on current (heating) only. Voltage has nothing to do with trip settings. I believe you are misunderstanding the meaning of the wye/delta scale. There appears to be a ratio of 1:1.77 between the left and right sides of the scale, but this is not the same as 1:2 voltage ratio you inferred. My feeling is this scale has to do with application on a wye-delta reduced voltage starter and not between normal high and low voltage motor winding connections. The right hand column numbers don't workout to the KW ratings of the corresponding FLAs. Is there any documentation? I see all sorts of labal data in the background. It should include instructions for setting the OL. If you are concerned about setting it up, I would adjust the OL based on motor nameplate data. Remember to account for service factor. The label in the background is for a Cutler Hammer IEC starter that I have stickered to my test rig. There is no documentation from the customer. I think JBD hit it on the head. My suspicion was an additional reduced voltage starter control block option similar to the Moeller stuff I've seen. I have tested it to the trip limits with 460 and was satisfied with the overload trigger, but I like being 100% on everything I test. I think it's odd to label something when the function is an option versus core operation. Wait until you have some poorly translated manuals. Often amusing.